And that’s exactly what Jeff Kass­ab did after months of chemotherapy, radiation, and surgery to cure his co­lon cancer. He prayed to Jesus Christ and his favorite saint, Padre Pio. He had not always been this sub­missive. 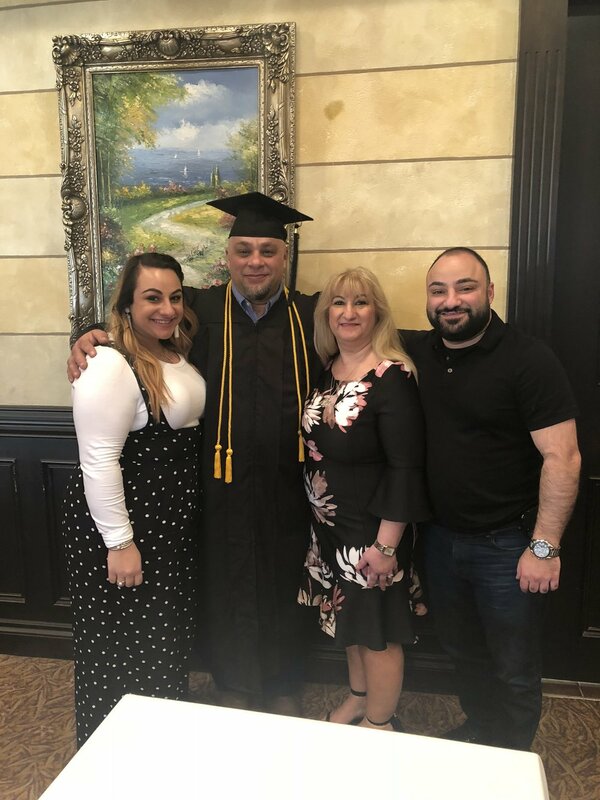 Kassab, 51, grew up in Madison Heights, attending the now-defunct St. Dennis Catholic School in Royal Oak as well as St. Joseph Chaldean Catholic Church in Troy from the time it opened in the early 80s. An altar boy, he was always learning about religion and the Bible from his devout mother, Najat. He married his wife Ahlam when he was 22, and together they contin­ued to be active in the church until they got caught up with what hap­pens to most young couples – life! They were raising two small chil­dren, working, paying bills, and “put­ting God to the side,” Kassab said. They were only going to church two to three times a year. As his kids got older, Kassab real­ized he needed to be the father that will lead his kids to Christ. While they understood the Catholic faith, it was not so impressed upon them, and he wished to be the example. In 2006, he began to take a more dili­gent role in the faith, not only by at­tending, but also by leading. On March 5, 2011, Kassab was blessed as a sub deacon at St. Joseph by Father Zouhair Kejbou and Father Rudy Zoma. He had been diagnosed with colon cancer just before Christ­mas four months prior. In May of 2011, he underwent surgery and then endured four more months of chemo. By the grace of God, he has been cured and cancer-free for seven years. That is why he had told the Lord he desired to be at his service. Kassab was not expecting what he received from that prayer-- a call­ing from the Holy Spirit to go to the seminary and study theology. But the Holy Spirit kept pound­ing on his heart, he said. This went on for months. Then Ahlam noticed him looking miserable, and she asked him what was wrong. He told her. “How long are you going to keep saying no to Jesus?” Ahlam ques­tioned. And that was all he needed to hear. Two days later, he went to Sacred Heart Major Seminary in Detroit and obtained the necessary paper­work. He began in the Fall of 2013, and at 50 years old, graduated this past April with a Bachelors of Arts in Pastoral Theology. That is, tak­ing what you learned and applying it through evangelization, including teaching in private schools. The theologian remembers that as a young Chaldean guy in the 80s, go­ing to college was not greatly encour­aged, whereas now it is quite expect­ed. He always felt like he was missing out on something special though. He attended Oakland Commu­nity College (OCC) for a year after graduating from Lamphere High School in 1985 but stopped to work. Later, he went back to OCC to pre­pare for Lawrence Tech University in hopes of getting an engineering de­gree, but that dream was also put on hold after he bought a store. Kassab admits that one will come up with 100 excuses not to do some­thing, just like he did. Kassab believes strongly in the “call to evangelization,” spreading the gospel of Jesus Christ in any form. That is why he presents on a myriad of topics, like Pope Francis and the Papacy and Reflections on the Sacred Heart of Jesus. He trav­els to different churches in hopes of reaching as many people as he can. He also leads bible studies and dis­cussions. Apologetics – defending the faith – is his niche though. He maintains that not everything is explicit in the Bible; therefore, the faithful must look at how the Apostles and early church leaders from the first two to three centuries interpreted the Gos­pels. He is known for explaining it in a way that makes sense in the 21st century. In the past few years, Kassab has noticed a fair amount of men from their late teens to 40 years old be­come heavily involved in the faith, and he is proud of this new genera­tion of leaders. He hopes that more men aged 40-60 engage in religious learning. He attributes this lack of partici­pation to the formative young adult years, when the church did not have this kind of evangelization 30 years ago. He and Bashar Kirma, another faithful evangelist, started a men’s group called Genesis 4:9 through the Eastern Catholic Re-Evangelization Center (ECRC) in hopes of bringing more men closer to Christ. Kassab will also be leading a new program at ECRC centered around the journey to Heaven. “The greater your sufferings, the greater God’s love for you,” Padre Pio said. Just as he endured with the stig­mata, Kassab endured too with his cancer. That is why he grew so close to the saint and to the Sacred Heart of Jesus, Padre Pio’s devotion. It was through that suffering that he came to be the man he is today. He recites his favorite Bible quote: “It’s no longer I that lives, it is Christ that lives in me” (Galatians 2:20).